Sometimes, it's just not possible to get the store to pick up a fresh bouquet of basil that you need for dinner. Therefore, when a recipe calls for fresh herbs, but you only have the dried version, there's no need to panic. Use an easy formula to use as a fresh to dried herb converter: 1 teaspoon of dried herbs for every tablespoon of fresh herbs. In other words, use three times as much fresh herbs when the recipe calls for dried and one-third of the amount of dry herbs when the recipe calls for fresh. Basil: Substitute 1 teaspoon of dried basil for every 2 teaspoons of fresh basil. Ginger: Substitute 1/4 teaspoon dry ground ginger for every teaspoon of freshly grated gingerroot. Onion: Substitute 1 teaspoon onion powder for every medium fresh onion. Sage: Substitute 1 teaspoon dried sage for every seven fresh leaves or 2 teaspoons minced fresh sage. Thyme: Substitute 3/4 teaspoons ground time for every six sprigs or 1 tablespoon fresh thyme. A fresh to dried herb converter isn't the only thing you need to consider when making the swap. Dried herbs and fresh herbs need to be added to recipes at different stages. The former is best to be added during the cooking process, as it allows the flavors to infuse into the whole dish. However, wait until the end of the recipe to include the fresh herbs, so they maintain their brightness and vibrant color. 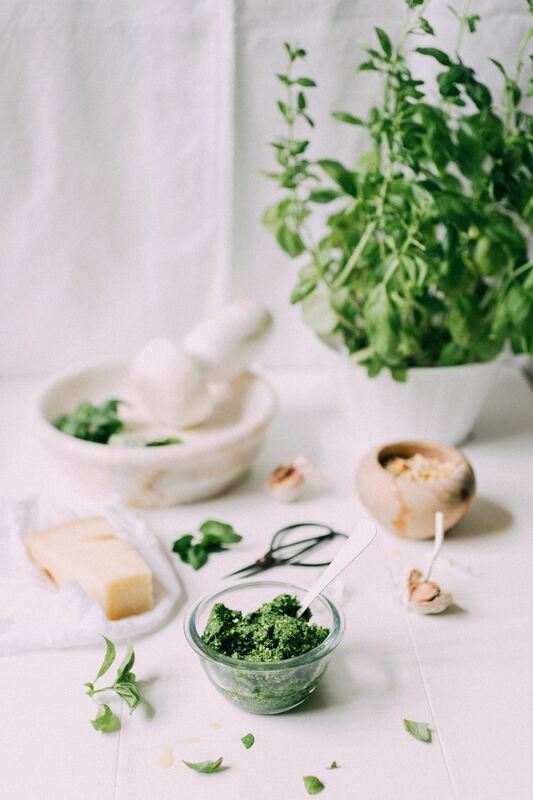 Sometimes, dishes benefit most from a sprinkling of fresh herb right before serving. Dried herbs are ideal in soups and stews, and cooked sauces, as well as in a spice rub. Use fresh herbs when making salad dressings and salsas or if you just want a pop of color as a garnish when serving a dish. Before you sprinkle the herbs into a dish, crush the flakes into the palm of your hand. This helps release the aromatic oils of the herbs, which will boost the flavor intensity of your meal. Dried herbs will lose their potency quickly if not stored properly. Keep in airtight jars or containers in a drawer or cabinet. After being kept in optimal storage for a year, the herbs will begin to deteriorate. Toss them, and purchase new jars. If you're not sure how long a jar of herbs has been in storage, open up the jar and give it a sniff to make sure they still have potency. If there's no significant aroma in the jar, it's certainly not going to add the flavor that you want during the cooking process. Store fresh herbs similarly to how you store flowers: Use a glass or jar with a few inches of cold water, covered with a plastic bag if you choose, and placed in the refrigerator. Fresh herbs can be as much as 80% water. When dried, they lose all that water and become more potent than their fresh versions. The one exception to this rule is a bay leaf, which loses a lot of its flavor when dried. If replacing a fresh bay leaf with dried, increase the quantity to two dried bay leaves. Dried herbs don't taste quite the same as fresh herbs, as their taste can be slightly bitter. Some herbs that just aren't very good when dried, such as parsley. During the drying process, the parsley loses most of its flavor. Other herbs to avoid buying dry are cilantro, chives, and chervil, also known as French parsley. However, you can purchase dehydrated versions of these herbs that will work in a pinch, though it might be a better idea to substitute the fresh herbs with another variety.